Matty Pearson in action for FC Halifax Town in their last meeting with Bradford Park Avenue at The Shay in 2013. FC Halifax Town will be red-hot favourites when they host winless Bradford Park Avenue on Saturday (3pm). Park Avenue sacked their manager Alex Meechan earlier this week and replaced him with former Guiseley boss and ex Halifax captain Mark Bower. 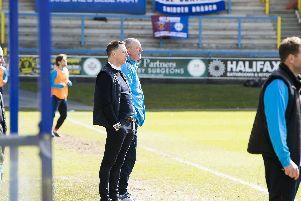 They are without a win so far this season, having lost eight and drawn three of their first eleven league matches, and are rock bottom of the National League North. They also lost in the FA Cup against Salford at the weekend. They have lost eight games in a row, equalling the record of consecutive defeats for the reformed club. Only Telford and Stalybridge have scored fewer goals in the division than Avenue, who have conceded three or mopre goals on six occasions this campaign, with only Altrincham having a worse goal difference. Town’s Josh Wilde will return after illness prevented him from playing at Ashton, while Keil O’Brien is available after Southport refused permission for him to play in the FA Cup for Halifax. But midfielders Nathan Hotte and Matty Kosylo will both miss out through a groin strain and a knee injury respectively. But both could be available next weekend. New signing David Lynch is expected to go straight into the squad for tomorrow’s game. Park Avenue beat Town 1-0 in their last meeting at The Shay in April 2013 when ex-Halifax man Richard Marshall scored for the visitors, while Ryan Toulson was sent-off for The Shaymen. Toulson and Nicky Wroe are two ex-Town players in the ranks at the Horsfall Stadium. Toulson joined Park Avenue after being released by Guiseley at the end of last season, who he helped survice in the National League at the expense of Halifax. He left The Shay in 2014 after an association with the club stretching back more than 10 years. Toulson came through the youth team with the old Halifax Town, making his debut under Chris Wilder before rejoining the new club in 2011, helping them to promotion to the Conference Premier and scoring two goals in 109 appearances under Neil Aspin. Wroe was captain of Halifax last term, and scored four goals in 40 appearances for the club. FC Halifax Town’s Supporters Trust have decided their bucket collections at the Park Avenue match will be donated to a fund in memory of Daniel Wilkinson, who collapsed and died while playing for Shaw Lane at Brighouse Town earlier this month.